Popular belief holds that gold doesn’t fare well as interest rates rise. But one expert believes the metal’s future is bright no matter what the Fed does. Read why here. This week, Your News to Know brings you the most relevant news stories about the gold market and the overall economy. Stories include: Why Peter Schiff is bullish on gold, Chinese gold demand booms due to a looming dealer default, and Nestlé is now selling edible gold Kit Kats. Peter Schiff is well-known for his keen financial commentary, often taking either a bullish or bearish stance. Gold is one commodity where Schiff’s bullish stance is clear: He believes that the metal has a prosperous future, regardless of a rates hike. In recent weeks, gold has jumped up and down as market sentiment towards the likelihood of a hike shifted. The metal rallied to nearly $1,200 only to head back a little. In a commentary on CNBC, Schiff explained why this is actually a good thing, and why a rates hike might be beneficial for gold. For one, Schiff views the recent fall from slightly below $1,200 levels as an “unexpected gift” that offers a second chance at an entry level to those investors who missed it six weeks ago. But this is just the start of Schiff’s bullish sentiment – he firmly dismisses those who feel a rates hike would send gold plunging downwards, instead leaning towards the opposite. It’s obvious why the absence of a December rates hike would benefit gold: The Fed would lose all its credibility and investors would believe we’re stuck with zero rates for the foreseeable future, which would “ignite a gold rally for the ages.” According to Schiff, though, the yellow metal stands to benefit nearly as much if the Fed does pull the trigger. He explains how investors have already “baked” several hundreds of rate-increase basis points into the current price of gold, whereas an actual hike would only be 25-point strong. In line with the Fed’s dovish stance on a rates hike, a 25-point rise would also likely be a one-and-done deal, further encouraging investors to re-embrace the metal. The last time the Fed got to raising rates, gold experienced an almost-continuous rise over two years, ending with a 62 percent total increase. “So it’s a myth that higher interest rates are automatically bearish for gold,” Schiff says. But there’s more: An upwards move in rates would bring us closer to a fresh easing cycle, which is “extremely bullish for gold” – markets might even start pricing in the first rate cut as soon as a hike happens. Seeking Alpha contributor Avery Goodman recently dissected a Reuters article which encourages a bearish stance on gold using false citations. Goodman takes major issue with this, as tens of thousands of Western investors will read the article and form opinions based on it. For those unfamiliar with the situation, Chinese gold lenders are dealing with an increasing number of defaults by borrowers. The Reuters article purports that this will have an adverse effect on the yellow metal and lower its prices, but Goodman firmly opposes this view, citing hard evidence to the contrary. During the early stages of any debt crisis, there is an increase in demand for the currency needed to repay the loans – Swiss francs during the European debt crisis are just one example of this. 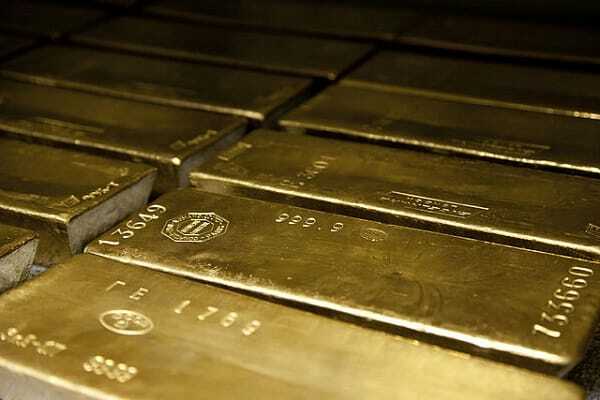 Goodman sees no reason things should go differently with the gold debt crisis – missing gold will have to be replaced with new gold, which is sure to raise demand for bullion. But since this demand is already so high all around the globe, Goodman wonders: Why hasn’t the price exploded yet? Despite booming demand, prices can only rise when the “supplier of last resort” can no longer fill the deficits. Some might wonder who this supplier might be, but Goodman sees no mystery in it: He points the finger to the Federal Reserve itself. But even the Fed and its once-8,000 tons of gold can only bail out their agents for so long. When the last supplier of gold runs out, be it for physical or political reasons, the metal will see a dramatic increase in prices. Goodman also wonders whether numerous misleading reports that undermine gold and dismiss it as a “relic” are simply the result of “lazy reporting” or if there is something sinister going on. After all, why were Goldman Sachs and HSBC issuing bearish statements advising investors against gold while at the same time making huge long term investments on it? Goodman leaves that part to the reader’s imagination. The Kit Kat is a very popular chocolate bar. So popular, in fact, that the special Kit Kat boutique store in Japan (called the Chocolatory) is approaching a milestone of one million customers. To celebrate this, Nestlé is making Kit Kats covered with an extremely thin layer of 24-carat gold, which Time.com’s Ethan Wolff-Mann dubs “Willy Wonka-inspired”. The amount of gold used is small enough to allow Nestlé to sell these Kit Kats for $16 each. Aside from making a trip to Japan, those wanting to taste a gold-plated Kit Kat will also deal with quite a bit of competition: While the special chocolates are available to customers, only 500 are being made. If you do manage to get your hands on one, don’t worry about safety – gold is indigestible and non-reactionary, making it safe to eat. Nestlé will also produce an inedible 230-gram Kit Kat made entirely from 24-karat gold, although this version will only be available to those in the manufacturer’s membership program.